A routine and essential question in modern day police investigations is: Does digital evidence exist, especially video? Did any security cameras capture images that can yield useful evidence or clues? It is advantageous to discover and capture this data very early in an investigation. Data may become lost, altered, or the owner of the CCTV system could become uncooperative. The problem with video data is that there are so many different formats for security cameras and several hardware configurations. To retrieve this data in the field, an officer must have several types of software and hardware and have the knowledge and experience to operate the various retrieval systems and techniques. Then the data needs to be downloaded into a compatible system, whereby the data can be reviewed, organized, and ultimately edited for court or further investigatory purposes. The amount of digital evidence is growing rapidly and it needs to be retrieved easily, with minimal knowledge and experience, and be compatible with one video analysis and file management system. Your agency needs to become less reliant on a technically trained officer "to do everything." With video data growing exponentially the logistics of time and place dictate that more of your investigators should be involved in the video retrieval and review process. At the scene of the crime, you need the right gear. 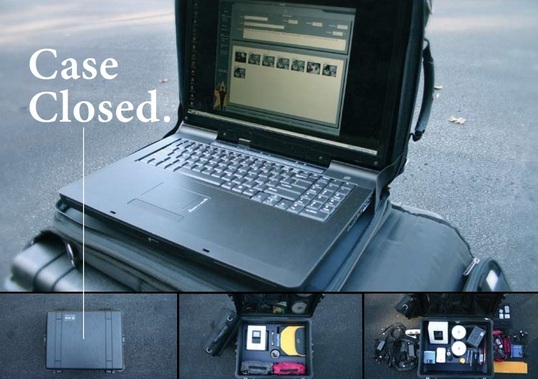 A comprehensive kit with everything required to catch criminals with video evidence. StarWitness Field Kits contain everything you need to perform successful recoveries from digital CCTV surveillance systems-right at the scene of the crime. No matter what the system throws at you. You'll be able to turn around solid original video evidence, video evidence that will help your investigations and court dates.